Meg's Food! | It's no problem - Meg's Food! Albania and Macedonia aren’t usually countries you hear that are high on people’s travel lists. They certainly weren’t high on my list. But after going to India for the month, I wanted to go somewhere to justify that massive plane ticket. Most of the places that top my current travel list (Malawi, Borneo, Northern Africa) are too big for a two or three week trip. I’ve never been to continental Europe, because honestly, it never interested me too much. I like going places that are a little different, a little off-the-beaten-path, and of course, are cheap. So I looked east. I’ve read a few novels recently that take place in the Balkans, so maybe that’s why I started researching the area. And I’m SO glad I did! We arrived in Albania by boat, from Corfu. The customs and immigration process consisted of one customs official in a small building by the sea, who stamped my password without asking any questions about where I was going or what I was doing in Albania. We were in. 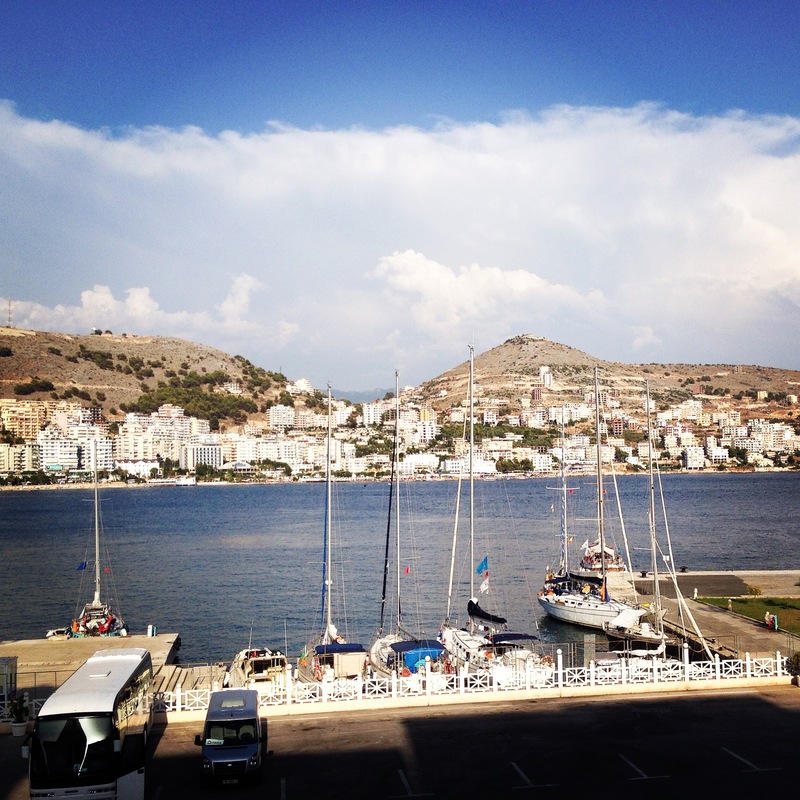 We spent a few days in the town of Saranda, a cute little town on the Ionian sea. It was HOT, but Saranda is gorgeous. It’s part of the ‘Albanian Riviera’ – a cheaper, slightly grittier version of the very popular Croatian coast. Albanians are incredibly friendly. You hear “it’s no problem” almost all the time. That laid back attitude is infectious, and pretty soon we found ourselves relaxing on a crowded but lovely beach for day, eating Albanian pastries (burek), and fresh grapes and oranges. 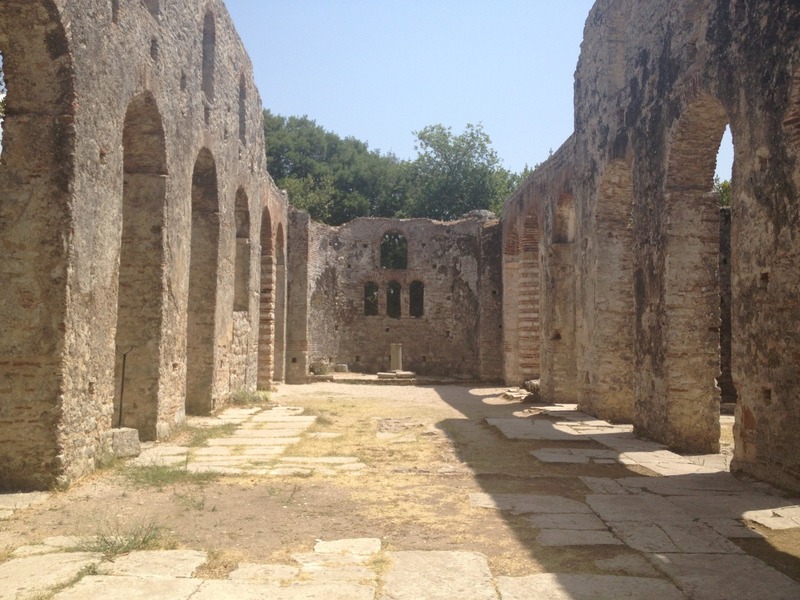 Nearby Saranda are the ruins of Butrint, recently revitalized in 2005. 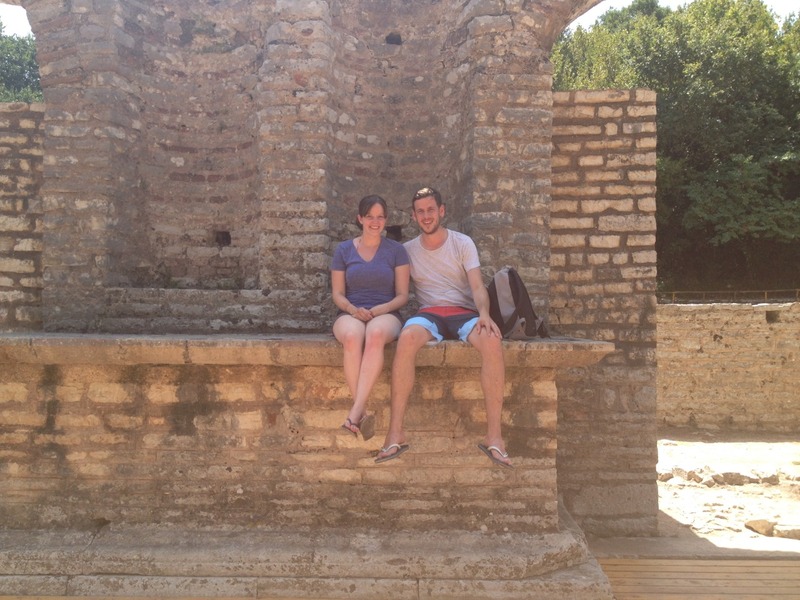 Unlike a lot of ruins in Western Europe, we had these almost to ourselves. They date from the 1st century BC to around the 5th century AD, and we were able to wander and explore almost everywhere. After a few days in Albania, it was time for the LONG journey to Macedonia. We started at 5am, taking a bus to a town called Korce. It’s only about 200 km from Saranda but took 9 hours, winding through valleys of farms and villages, and switchbacking over beautiful mountains. We stopped at one point for coffee in the middle of Albania, where old men were playing an aggressive game of dominoes, and watched a thunderstorm cross over one of the mountains. It was such a beautiful drive. Once we got to Korce, we had to find a van to take us to a town called Pogradec, on the coast of Lake Ohrid. We asked a few drivers, and, thanks to that Albanian friendliness, one driver shouted to his buddy across the road that we needed to get to Pogradec. He promptly told the 4 or 5 Albanians already in the van to get out, since he was changing routes. He ended up driving us and two South Koreans to Pogradec, and then straight to the Macedonian border. We were stamped out of Albania, walked the 300 or so meters of no-mans-land to Macedonia, and then hitched a ride to our hostel on the shore of Lake Ohrid. The friendly Albanian who picked us up in London for 15 years so spoke impeccable English (with more than a hint of a north London accent). He told us all about how messed up Albania was and still is, while his father, who was in the car and following the conversation but spoke no English, railed against the former communist leadership in Albanian. It was such a cool experience to meet them both! Macedonia is stunning. 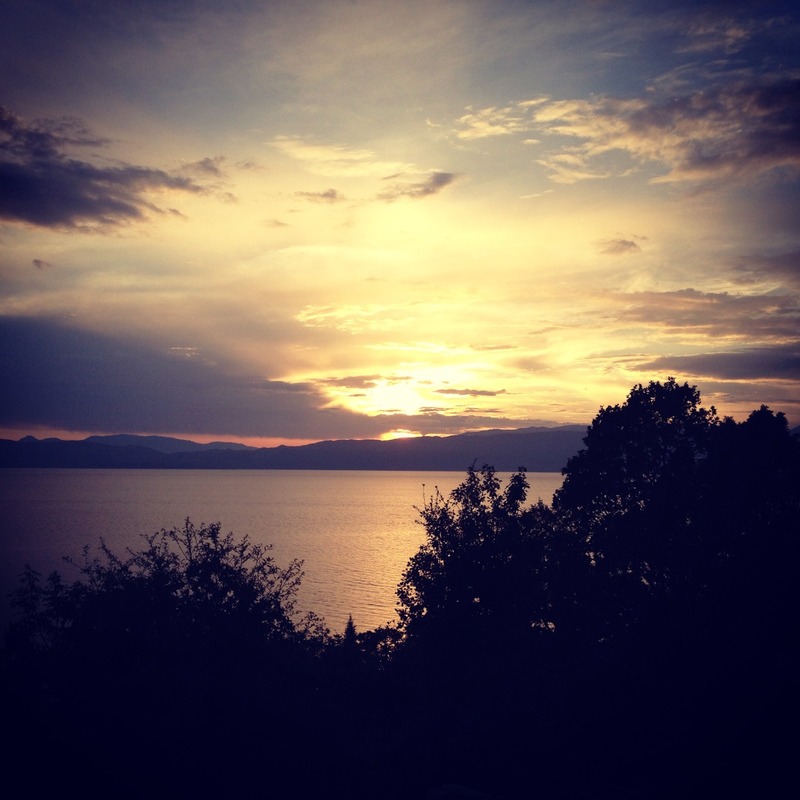 We spent two days at Lake Ohrid, staying in a little hostel that has ridiculous views of the sun setting over the lake. The lake is beautiful; it is surrounded by mountains that tumble down into the water. The town of Ohrid is a UNESCO heritage site, crowded with Byzantine-era castles and churches that look down on the village and the lake from cliffs. 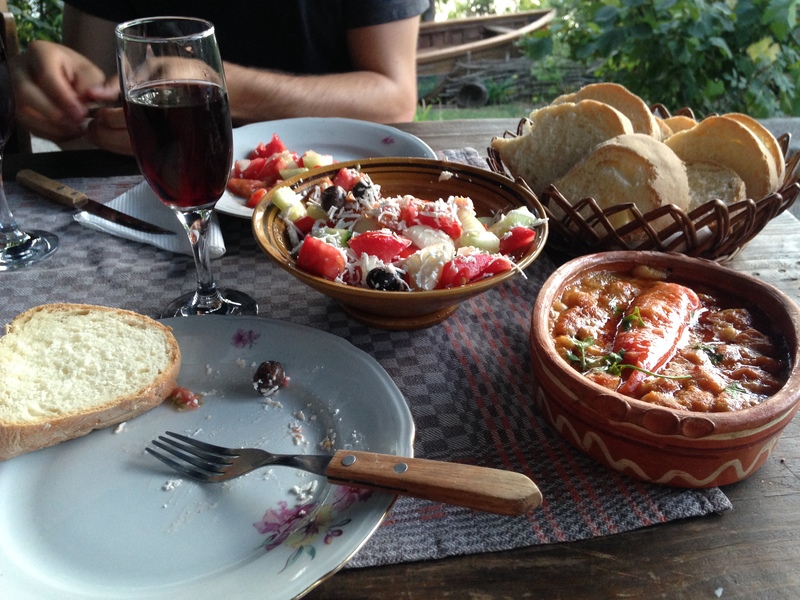 The food is also amazing – the national dish is baked beans, so I’m obviously in heaven. Macedonian food is all about vegetables – tomatoes, eggplant, peppers – beans, potatoes, and a delicious red pepper spread called ajvar. We’ve been eating well. 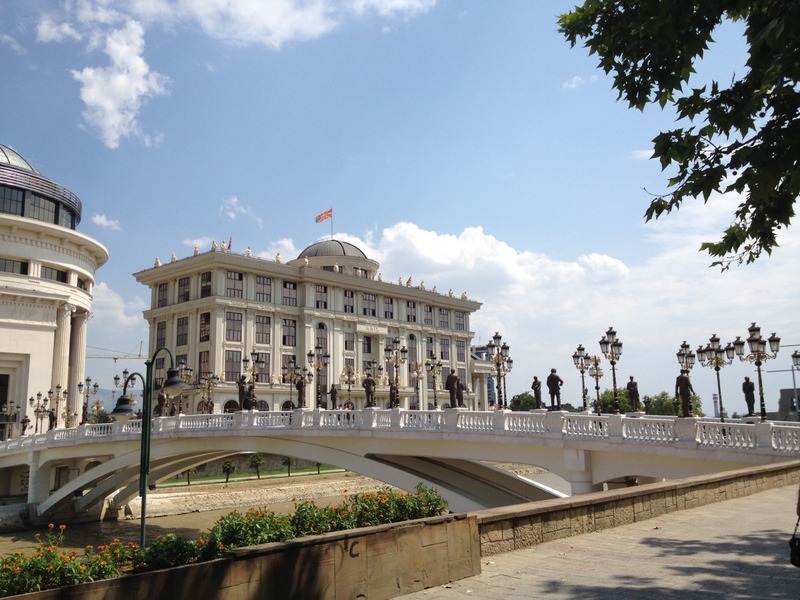 When we sadly left Ohrid, we headed for the capital, Skopje. It’s a quirky place – all the government buildings are being re-done in Greek neoclassical style (although here they’ll tell you it’s Macedonian neoclassical style), and there are statues and fountains and other ostentatious monuments EVERYWHERE. Apparently building a statue park is a great way to embezzle money, so the city is full of them. Tonight we head to Belgrade, a totally different part of the Balkans. We’re sad to be leaving the laid back south, with it’s veggie friendly meals, but excited for a few days in fast-paced cities! 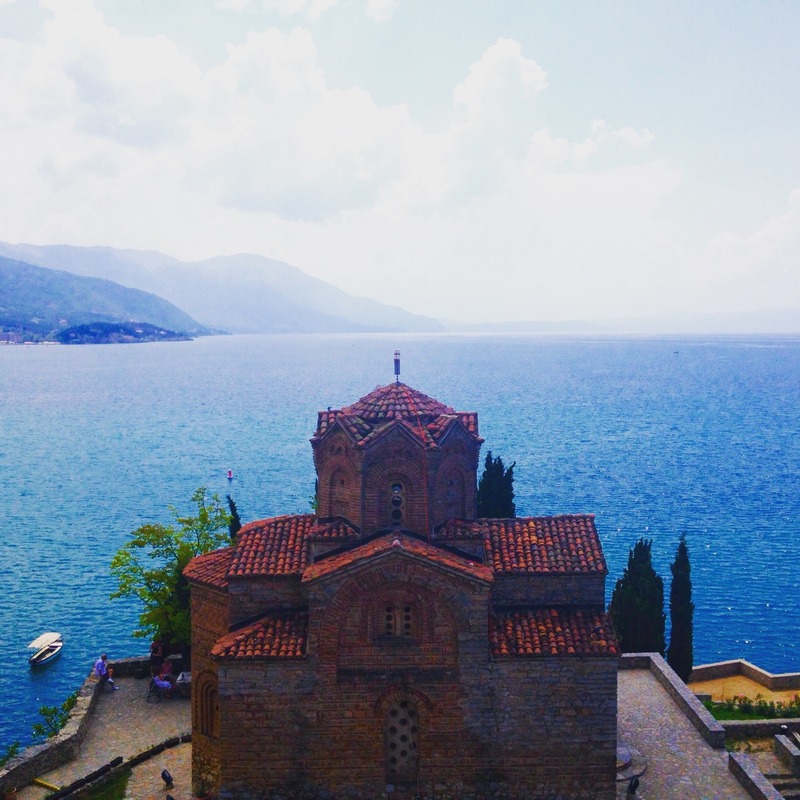 This entry was posted in Life, Travel and tagged albania, balkans, macedonia, travel. Bookmark the permalink.